The James Webb Space Telescope (JWST) to be launched sometime 2018 will be replacing the Hubble Space Telescope. NASA, the European Space Agency, and the Canadian Space Agency have collaborated in the project since 1996. It is built to peer farther into space than the Hubble can and measure and observe objects in space from the early Universe. Since it's mission is to study objects farther into space, the size, its orbit and the mirrors of the telescope, the instruments on the James Webb Space Telescope are different from those in the Hubble. The mirror of the JWST is 6.5 meters in diameter and will have a five layer sunshield the size of a tennis court. It will be positioned around 1.5 million kilometers (930,000 miles) from the Earth and is designed to work primarily in the infrared range of the electromagnetic spectrum. Compared to JWST, the Hubble Space Telescope is positioned 353 miles away from the Earth. The JWST can observe objects up to a redshift of 15. In contrast, the Hubble observes up to a redshift of 6. A redshift is the light coming from an object moving away from the observer. Because the universe is expanding, objects in space are moving away from each other. As this happens, the lightwave emitted from the object is "stretched" moving it closer to the red spectrum; a redshift. By having the JWST able to study farther objects, astronomers can study objects from the early universe and peer through dust covered stars and galaxies that the Hubble is not able to do. There are four mission themes of the JWST. It is calculated that the universe is about 14 billion years old and astronomers have only observed a fraction of it (around an area 1/4th the diameter of the moon). 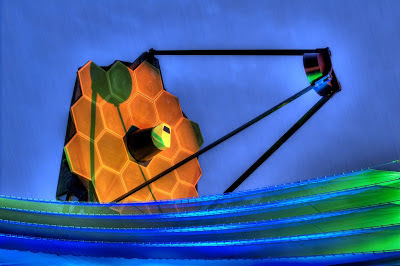 The JWST as well as other developing instruments will help know more of the universe and its beginnints. The James Webb Space Telescope was named after the NASA Administrator who crafted the Apollo program, and who was a staunch supporter of space science.